As we prepare to celebrate the birthday of The Rev. Dr. Martin Luther King, Jr., I’m encouraged to revisit a previous essay that I feel is even more relevant as we enter yet another election year and as we continue to deal with the pressing social justice issues that plague the American society today. Also, I serve as the 2011-2012 MLK Celebration Committee Co-Chair at Ohio University and as someone who has always prided myself on being an activist who believes it’s my duty to carry on the legacy of Dr. King, my parents, and other ancestors and community leaders, and as an educator, I also believe that there is a lack of personal accountability for activism within our own communities. We don’t all have to become a huge “Dr. King” like icon, but we can all pick up the reigns of The Civil Rights Movement and make small changes within our communities, in our own special way. This essay is a challenge to us in 2012. Where is your activism? Recently, the MLK Memorial was unveiled in Washington, D.C., paying commemoration to the Rev. Dr. Martin Luther King, Jr., the Great American Icon who stood for peace, not just for African Americans, but for all. And given all of the latest rhetoric regarding social and community justice and who should be responsible for the Black community by way of jobs and services, I am invited to focus on my generation, formally known as “Generation X”, those of who fall into the 30 and over crowd. We were born between 1965 and 1980 and are the by-products or beneficiaries of the post-Civil Rights Movement. Most of our parents grew up in during the 1940’s – 1960’s and experienced firsthand, the movement from a front row seat. Many of our parents were activists, some moved up North to get good jobs and became what we knew as the American Middle Class and as a result many of us (now in our 30’s and 40’s) were privileged to attend college, get pretty good jobs, and were left to pick up the reigns of activism and change within our communities. So my question to you (to us) is, in light of the MLK Memorial and our quest to keep America’s first Black President, Barack Obama in office for a second term, what are we, “Generation X” doing in our communities to address the issues that continue to plague us? How are we carrying on the legacies of Rev. Dr. Martin Luther King, Jr., Malcolm X, Fannie Lou Hamer, Thurgood Marshall, Coretta Scott King, Angela Davis, and the other endless sometimes nameless leaders of the movement? How are we carrying on the legacy of fighting for the rights of the poor, for women, for children? How are we today, fighting to address the issues that affect our communities like healthcare, poverty, homelessness, joblessness, racism, sexism, and the many other issues that plague society today? Are you an educator? Do you tutor? Do you coach a sports team? Do you mentor? Have you signed a petition? Do you write your local politicians? Do you visit the sick? Do you give to the poor? Do you feed the homeless? Do you give to scholarship funds so our students can to go to college? These and many other questions are what I’m hoping will spark us to become active if we are not already. It will be us, not the president, not the politicians, and not someone else, who should be willing to get our hands dirty, who will be the ones to fix our communities and hold them up to the standard that Dr. King and so many others held us to. I want to hear from you, as the 30 & Over crowd, who has been left with this heavy legacy, in a society overwhelmed with pop culture and the influence of a false sense of success while in reality some members of our communities are drowning under the possibility of losing the right to pursue the American Dream, How are you (me, you, we) helping to keep the movement going? And while we all can’t or won’t ever be able to replace our activists and leaders of the past, we all have our part to play. What activities are you involved in that you think are making a difference? Please share your activism with me on Twitter (@ivywriter with the trend topic #BeActive). 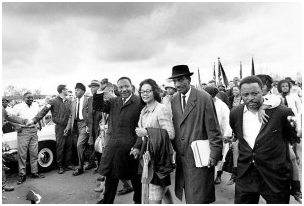 activismCivil Rights MovementDr. Martin Luther Kind Jr.Martin Luther King's birthdayMLKRev Dr Martin Luther King Jr.